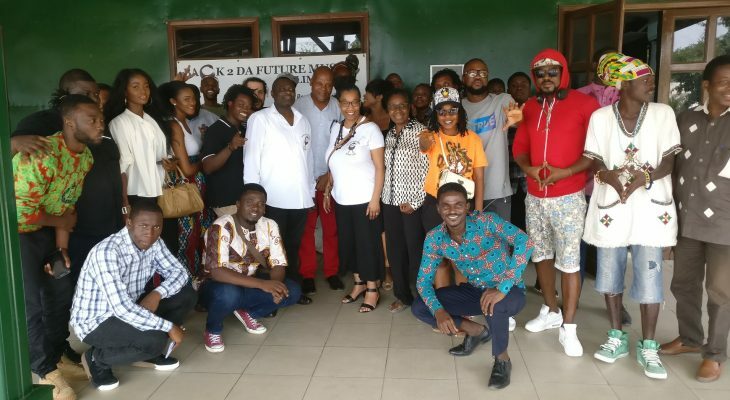 Back 2 Da Future Music CEO, Kennedy Mensah, kicked off the London based company’s 10th Anniversary Workshop Tour in fine style in Accra, Ghana during Independence week. “As you’d say in Jamaica – ‘you have to dance ah Yard before you dance abroad’ (learn to dance at home before you dance in public)”, explained Kennedy – born in Britain to Ghanaian parents – in answer to why the tour started in Ghana, whilst in interview before the event. After a media campaign which included print, Radio and TV interviews, the educational event attracted just under 40 Participants including artists, Managers, Producers, writers and composers. The half day event included interactive role play and was dotted with anecdotes from Mensah’s near 30 years’ experience. The morning started with an introduction to the facilitator and then continued with a history of Publishing for the lay person and ended with the creation of a contract – all delivered with aplomb by the some time Disc jockey and compere, Kennedy Mensah. “One of my mottos – paraphrased from Marcus Garvey – is ‘Each One Teach To Reach One’ – If writers and composers understand the basics of Publishing then our job as Music publishers becomes a little easier.” Concluded Kennedy who is looking forward to further Workshops in Europe, The Caribbean and Africa This year.